Dry Bulk Cargo Ship Opens Jakarta, Indonesia and looking for cargo for any direction.The vessel is available for voyage charter for loose break bulk cargo. Vessel chartering services for arranging right vessel along with negotiating the best ocean freight. The job work is undertaken with highest professional standards. or direct with ship owners and their representative and management companies. ship on voyage charter and successful shipment of any size, we are always available to serve you with our best services. Our experienced personals and staff with years of experience in handling break bulk shipping. Geared and gearless vessels available depending upon shipment size and requirements. Cargo ships can be arranged depending upon nature of cargo, shipment size, and other limitations. LADEN SPEED : 11.0 KNOTS WSNP UPTO BEAUFORT SCALE "4"
BALLAST SPEED : 12.0 KNOTS WSNP UPTO BEAUFORT SCALE "4"
* CHARTERERS TO ALLOW 5% ALLOWANCE FOR UNDER-PERFORMANCE CLAIMS. 01 YEAR + 01 YEAR + 01 YEAR +/- 10 DAYS IN CHOPTN. US, ISRAEL, ALBANIA, ERITREA, HAITI, CUBA, ORINOCO RIVER, ALASKA, MAINE, GULF OF BOTHNIA, SEA OF AZOV, TURKISH OCCUPIED CYPRUS, ALBANIA, SERBIA/MONTENEGRO, NORTH KOREA, SYRIA, LEBANON, SIERRA LEONE, CONGO, LIBERIA, ANGOLA, SOMALIA AND ANY UN SANCTIONED AREA OR COUNTRY AND ANY COUNTRY WHICH FROM TIME TO TIME BE PROHIBITED BY THE VESSELS FLAG STATE OR ANY COMPETENT AUTHORITY. TRAPPED IN OR OTHERWISE EXPOSED TO ICE. ALL WAR RISK INSURANCE, IF REQUIRED BY OWNER, TO BE FOR CHARTERERS ACCOUNT. THE COST OF ENGAGING THEM SHALL ALWAYS BE FOR CHARTERER'S ACCOUNT. APPROVAL, WHICH NOT TO BE UNREASONABLY WITHHELD. SHALL PAY FOR ANY ADDITIONAL INSURANCE PREMIUMS REQUIRED BY THE VESSEL'S UNDERWRITERS. BY THE VESSELS FLAG STATE OR ANY COMPETENT AUTHORITY. BUNKERS QUANTITY REMAINING ON BOARD ON DELIVERY / REDELIVERY SHALL BE DECLARED BY MASTER. TO REDELIVERY BY AND INDEPENDENT SURVEYOR MUTUALLY ACCEPTED BY OWNERS AND CHARTERERS. ACCOUNT. COST OF BOTH SURVEYS TO BE SPLIT FIFTH/FIFTY (50/50) BETWEEN OWNERS AND CHARTERERS. MUTUALLY BE APPOINTED BY BOTH PARTIES FOR THE ON/OFF HIRE SURVEY. VESSEL TO MAINTAIN LOADED TEMPERATURE UPTO 45 DEG C, MAX LOADED TEMP 55 DEG C.
LINE WITH VSL CERTIFICATE of FITNESS (CoF) / RESISTANCE LIST. OIL, LSHS, LSWR, CBFS, BITUMENS, ASPHALTENES, ASPHALTENE, CHEMICALS. 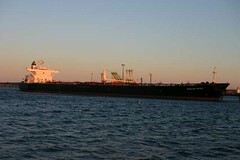 PRESENT THE VESSEL TO OWNERS WITH CARGO TANKS READY TO LOAD GAS OIL. USD rrrrr (GROSS) PER DAY PRO RATA INCLUDING OVERTIME PAYABLE 30 DAYS IN ADVANCE. TANK WASHING FOR CHANGING GRADES. 30 DAYS OR PRO RATA, PAYABLE ALONG WITH HIRE PAYMENT. HIRE TO BE PAID 2 MONTH IN ADVANCE TO OWNERS DESIGNATED BANK ACCT THROUGHOUT THE PERIOD OF THIS CHARTER. 2 MONTHS HIRE SHALL BE DEPOSIT TO OWNERS DESIGNATED ACCOUNT BY THE CHARTERERS WITHIN 3 BANKING DAYS UPON DELIVERY OF THE VESSEL. CHARTERERS NOT TO PAY HIRE FOR LAST 2 MONTHS OF CHARTER PERIOD WHICH OWNERS SHALL REGARD IT AS HIRE.